The French magazine LE MARIN, devotes an article to our POLAR solution (June issue). LE MARIN présente notre solution POLAR dans son numéro du 28 Juin. We were present at NAVEXPO (Lorient, FRANCE) in May 2018. SurvitecZodiac has received an important order for Autolaunch escape systems and liferafts from Baltic Workboats in Nasva, Estonia. The systems will be delivered early this year for installation aboard the first of two new vessels being built for the Swedish transport authority’s ferry company, Färjerederiet. The new ferry is due for completion in 2017 and will become a sister ship to the Saturnus which is currently the largest vessel in the Färjerederiet fleet. With a length of 100 meters and a beam of 18 metres the new ships are the largest built at the Estonian yard. It will have the capacity to carry up to 297 passengers and 80 cars along routes on Swedish waterways. 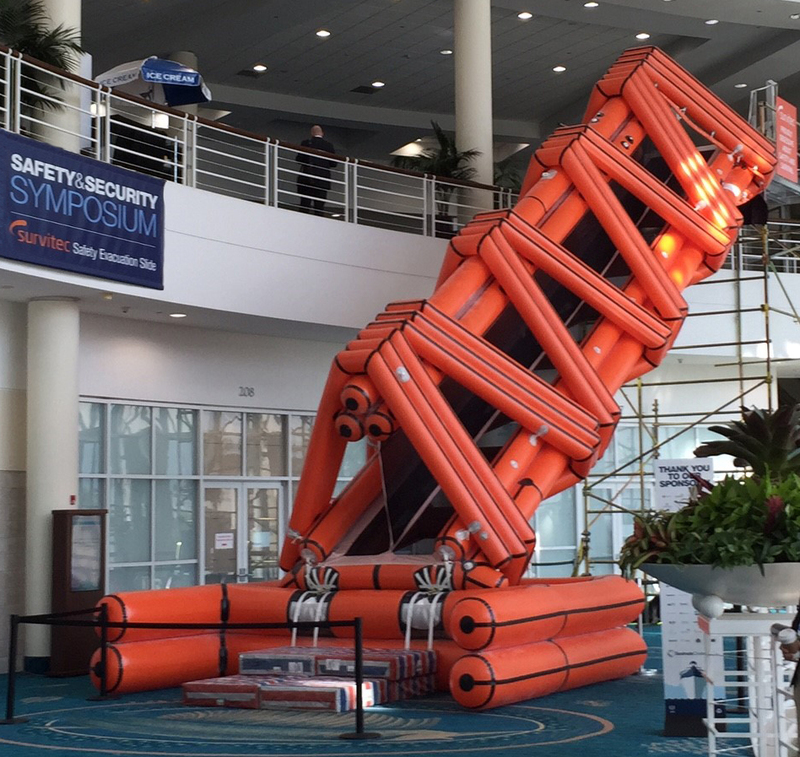 During SMM 2012, visitors to the Survitec Group stand will have the first opportunity to observe the new ‘remote liferaft launch’ feature for the world-leading SurvitecZodiac MIS (Medium Inflatable Slide) Escape Slide System. On display in Hall B1.OG on Stand 600, the innovative feature of the new SurvitecZodiac system enables a second liferaft to be remotely launched after the double track escape slide has been deployed and its first 150 person liferaft has been automatically inflated. By pulling a painter line on the ship, the new development allows the second liferaft to be deployed. Previously it was necessary for a crew member to descend into the first liferaft, from where the second could be inflated. The development of a remote inflation capability now eliminates the need for any crew to leave the ship ahead of passengers and permits the almost immediate deployment of a second liferaft as soon as the first has been activated. This is expected to save valuable seconds of vessel evacuation time for passengers and crew. 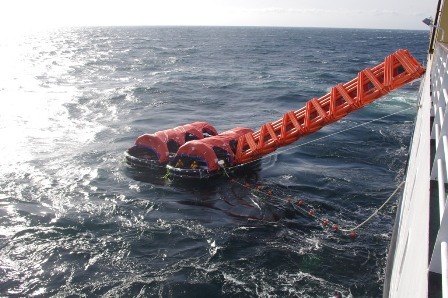 The SurvitecZodiac range of Marine Evacuation Systems is already at the forefront of escape slide performance, with this particular Escape Slide System offering high speed evacuation of 731 passengers in 30 minutes, when used with SurvitecZodiac Throw Over 150 person canopy liferafts. When used with SurvitecZodiac Open Reversible Inflatable 151 person open liferafts, 397 passengers can escape in 17 min 40 sec. All liferafts used by the new system are of the SurvitecZodiac Aspirator type and weighing in at just 490kg, makes a significant, overall weight reduction possible when compared to a regular Throw Over, Self Righting 150 person liferaft weight of 840kg. This demonstrates the system’s suitability for use on high speed craft. GRP containers allow for simple storage of the liferafts and the inflatable slide is folded and rolled around it on tilting deployment cradle, ensuring the SurvitecZodiac system is suitable for a wide range of vessels including high speed craft governed by the HSC Code, small passenger vessels operating in national waters, military vessels and RO-RO ferries on short international voyages. Come and find out more about Survitec Group at SMM Hamburg 2012. Hall BG.O1, Stand 600. Posidonia 2012 is just around the corner and it will be the first opportunity for visitors to see the SurvitecZodiac range of products being presented since the acquisition of the Zodiac Solas business by Survitec last summer. Our SurvitecZodiac customers will now benefit from the back-up and resources that are gained by being part of the world number one in marine safety and survival equipment. SurvitecZodiac will be exhibiting on stand number 3413 which will be listed in the catalogue under the name of its Greek distributor, Selas Kos. The SurvitecZodiac brand of liferafts will be represented prominently on the stand and will include more innovative products from our impressive range, including the Ultra Compact Xtrem liferaft and also our self-stacking davit-launched liferafts which are able to offer ship operators major savings in deck space and versatility. Dave Parslow, Sales Director, commented on SurvitecZodiac’s exhibition plans, "Our new, escape slide deployment DVD, which features the MIS MES escape slide, will also be a major feature on the stand. 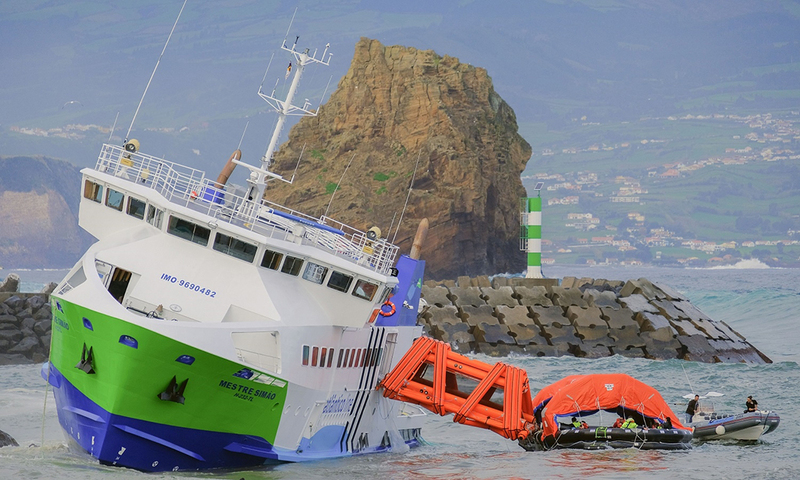 The SurvitecZodiac MIS MES is known to provide the fastest evacuation speed for small to medium-sized ships and high speed craft as it can enable the escape of 731 passengers in 30 minutes when used with the Throw-Over 150 person canopy life rafts. This advanced slide is available with a range of size and liferaft options which make it suitable for a wide variety of vessels either as a new build or a retro-fit." 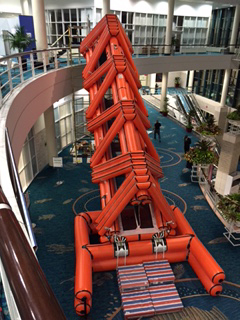 "We will also be showcasing our most recent escape slide innovation, the SurvitecZodiac MES ESS. This marine evacuation system features an inflatable slide and open reversible liferaft that can be launched and inflated automatically, by the ship’s Master pressing a button on the bridge. The unit is automatically launched over the ship’s side enabling the slide and raft to inflate. Self-tensioning electric winches then automatically pull-in bowsing lines to make the escape system secure and ready for use. 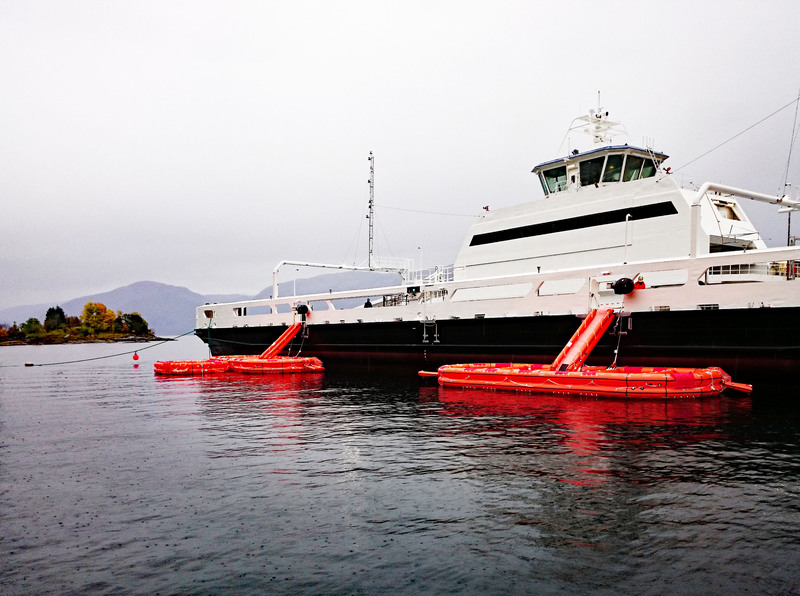 This system is likely to be of particular interest to operators of small ferries and passenger ships as it can free crews for other emergency duties that would not be possible if they had to launch a system manually." He added. SurvitecZodiac recently obtained EC Med, Transport Canada, and United States Coast Guard approval on their new large slide evacuation system. Check out the web page for more details New SurvitecZodiac Slide Check out the web page for more details here. Find parts you need to repair your rafts and see pictures of them to be sure you have right one.